A few months ago I had never heard the term bronies before. 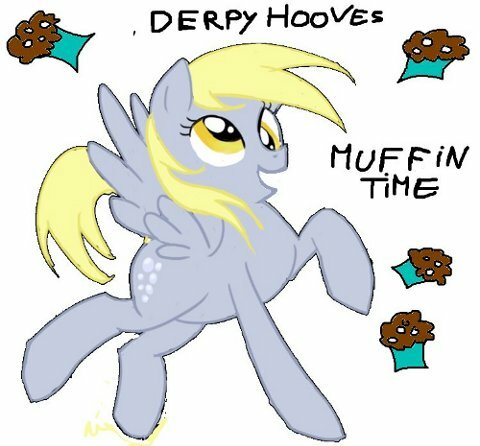 But somebody had jokingly posted a picture on my Facebook page of Derpy Hooves surrounded by muffins. 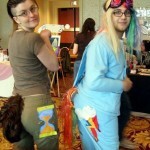 Someone else asked, incredulously, if we were bronies, which caused me to ask the Internets what the hell a brony was. (By the way, I also had to inquire about Derpy Hooves). Well, I found out. Boy, did I ever. The term bronies originates at the 4chan board (of course it does, where else, right?) Specifically the Cartoons and Comics area, which became fans of a certain cartoon for little girls called My Little Pony: Friendship Is Magic , which was created by The Hub, a kids channel started by Discovery and Hasbro. Now, everybody knows about My Little Pony, but apparently this animated series contains some in-jokes that go right over the heads of the kiddies watching. Eventually, internet memes started springing up around the show, some of them much more “mature” than what the tykes are watching on the Hub. Anyway, a fan community grew around MLP: Friendship is Magic, and this community includes older people (both males and females) who probably shouldn’t be taking a show like My Little Pony so seriously. But they do, and these people are called bronies (plural of brony, a portmanteau of bro and pony). You know, when I was in my twenties my friends and I were fans of the Pokemon cartoon show. 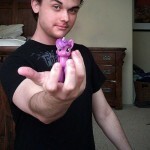 I am not afraid to admit that now, and that’s because of bronies. First we can’t believe this show is so good, then we can’t believe we’ve become fans for life, then we can’t believe we’re walking down the pink aisle at Toys R Us or asking for the girl’s toy in our Happy Meal. Then we can’t believe our friends haven’t seen it yet, then we can’t believe they’re becoming bronies too. My Little Pony is so popular now that it has spawned fansites (Ponychan and Equestria Daily), and conventions (BronyCon). What hath Hasbro wrought? Hmm, well I do remember watching Powerpuff Girls sometimes. And as a matter of fact, the creator of MLP: Friendship is Magic – 36 year old Lauren Faust – also was a writer and artist on The Powerpuff Girls. bronies were slightly more introverted and more agreeable than non-bronies. They tended to be more tolerant of others and bullied less often. Ninety-seven percent of brony respondents said they were single—but that was as opposed to being married. 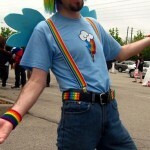 The happiest bronies (“social bronies”) came from open-minded homes with accepting, more liberal parents. 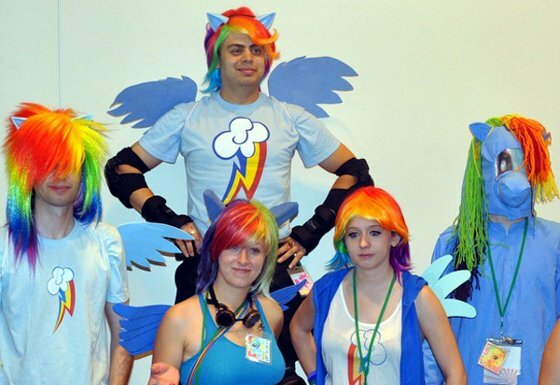 “Secret bronies” typically came from close-minded homes and were the brony equivalent of the withdrawn patients the two have seen in therapy for years. So, are bronies are here to stay, or is this just another fad that will be gone in a year or two?